In July 2009, I went on a work trip to Eindhoven. This is an extract from my blog. Bars in Eindhoven appear to be dominated by beer from Belgium, which is not a bad thing in itself but it is a shame that the Dutch beers seem to be limited to the pilsner style Bavaria and Dommelsch. Even the Trappist style La Trappe is rare. However, the one light on this is the range from Dutch brewery Hertog Jan, which has a wide range of interesting beers on bottle and draught and is well represented in Eindhoven. Belgian beers regularly seen on draught include Jupiler, Leffe and Palm, but bottled beers from many of the Belgian Trappist and Abbey beers are widely available. 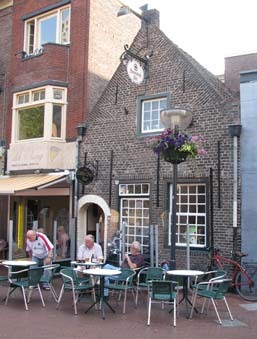 This was the first bar I visited and is a bar and restaurant on a small shopping street. There is a gorgeous beer garden out the back and a rack with newspapers and magazines for the customers to read. 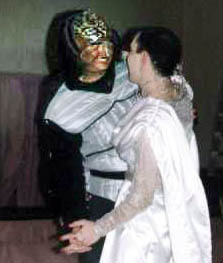 Sadly, the moderness of the bar took away its atmosphere somewhat. The beer range was OK though with Dommelsch, Hoegaarden Witbier, Leffe Blond and Dubbel, La Chouffe and Hertog Jan Weizenbier on draught plus a selection of Belgian bottled beers. I had a glass of Dommelsch, the first time I’d tried this beer. It was a basic pilsner and very refreshing on a hot day. I returned to this lovely bar three times during my two-day visit. It presents itself as a Belgian beer bar with an impressive bottled range on show and Belgian beer signs forming the decor. There is seating upstairs and downstairs and in front on the pavement. 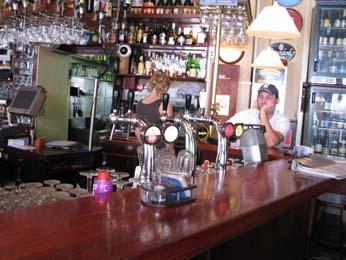 This is an older, more traditional looking bar than the Grand Café round the corner. It even has proper wooden bar stools. The Hertog Jan on draught here was a slightly sweet pleasant pilsner. The rest of the draught range included Jupiler, Blanche de Namur, De Koninck, Palm, Leffe Bruin, Hoegaarden and La Chouffe. This was one of the few places I found that sold bottled La Trappe and I had a nice bottle of the 10% Quadrupel as a night cap on my second day. 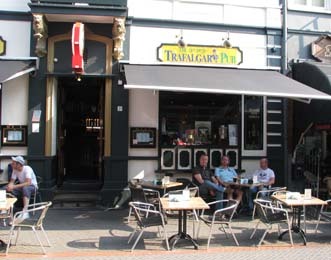 This large touristy looking pub has seating spilling out onto Eindhoven’s main market square. 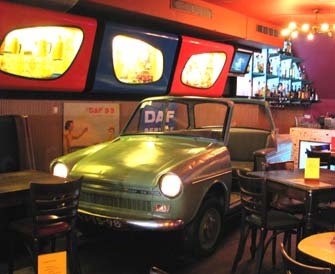 An unusual feature in the large bar area is an old Daf 33 car; Daf used to have a factory in the town. 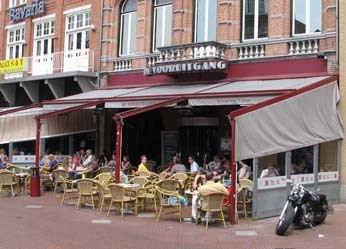 This is a good place to try the Hertog Jan beers as it has three different ones on draught – Pilsner, Weizenbier and Lentebock. 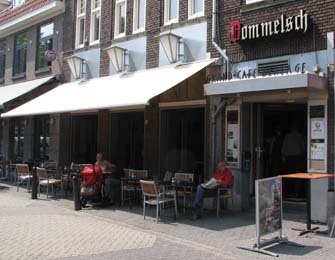 Dommelsch is also on draught joined by Palm, Hoegaarden and Leffe Bruin. The Palm beer I tried was served much too cold. There are the usual bottled Belgian beers. 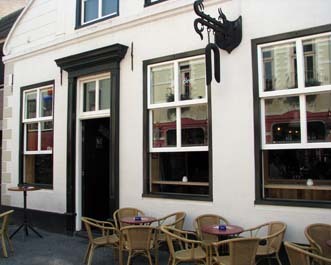 The bar does do food, but if you are in the mood for a Chinese I recommend the Nieuw Nan King opposite. 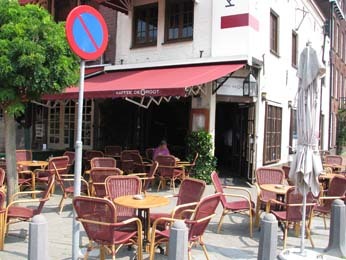 I did have a beer in there – a bottle of Heineken Oud Bruin – which was dark and flavoursome despite its 2.5% strength! This bar looks and feels like a bar should with wooden stools at the bar and old looking table seating; the plastic seats are reserved for the pavement outside. It also has an impressive beer pump with a model of three dancing ladies on top. Hertog Jan Weizener and Lentebock were on draught, and I tried the Lentebock, a very nice slightly sour beer. Also on draught were Dommelsch, Palm and Guinness. Belgian bottled beers were available as usual. This pub is on a busy street full of pubs but what makes it stand out are the three giant kegs of Bavaria suspended above the bar. The lady serving told me the two large ones each hold 1000 litres and the smaller one 500 litres. 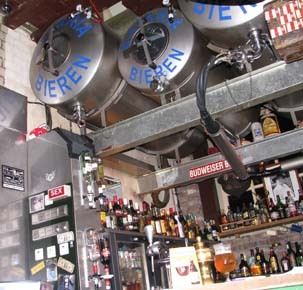 They are working kegs, as the piping runs from them straight to the Bavaria tap on the bar. Hoegaarden and La Chouffe were also on draught and the Dutch La Trappe sat among a range of Belgian bottled beers. The rock music was noticeable but not over loud and the medium sized bar also has a darts board and pool table. With a name like that, one would expect an English pub and there is a certain Englishness about it, typified by the red telephone box in the corner. This is not though reflected in the beer list – on draught the Irish Guinness and Kilkenny vie for space with Hertog Jan, Jupiler, Leffe, Hoegaarden and Palm. 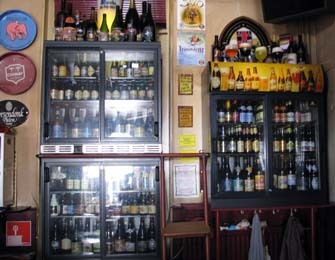 Various Dutch and Belgian bottled beers are also available. At first glance, the pub looks small and dark, but a little exploring shows it is bigger than expected going a long way back to another bar at the far end and a beer garden out back. As I left, I noticed the chalk board also listed Old Speckled Hen on draught, but I’d not seen any sign of that. I asked and was told it was on but was using one of the two Jupiler taps. Surely not, I thought, a Greene King beer masquerading as something else! This delightful little bar is possibly the smallest in Eindhoven, and the building is old, in fact the landlord told me that the building itself dates back to 1654 and is the oldest building in Eindhoven, though it has only been a pub since 1960. 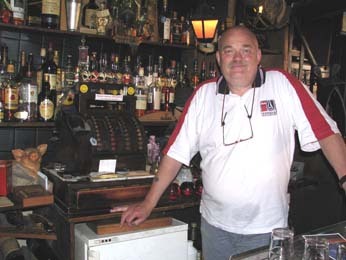 Just to see the old fashioned mechanical till behind the bar makes it worth a visit, especially as it is not for show, it is the bar’s working till. 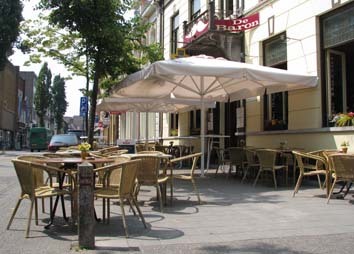 The 15 or 16 bar stools are the only visible seating inside, though there are some tables and chairs outside. On a busy day, the punters would have to gather round the piano The three draught beers are Hertog Jan Weizener, Dommelsch and Leffe Blond; Belgian bottled beers are also available.